We’ll kick things off in one of the oldest cities in the world: Jerusalem. A unique mix of bustling souks, ancient architecture – and of course, famous holy sites, you can’t fail to be wowed by this place. Tonight, bond with your new trip mates over a welcome dinner and get pumped for the next seven days. This is gonna be one for the books! Fuel up on breakfast, then hit the streets on a history-laden walking tour of this spiritual powerhouse. We’ll tick off the likes of the golden Dome of the Rock (where Muhammad began his journey to heaven), the Church of the Holy Sepulchre (where Jesus was crucified) and Judaism’s most religious site: the Western Wall. What. A. Day. You’ve got a free day to do Jerusalem your way. Grab a sabich sandwich and explore the city, or join an awesome optional day trip. What does the day trip involve, you ask? Well. First up, you’ll check out one of the most iconic destinations in the Holy Land: Jericho. After that, it’s onwards to Ramallah (‘God’s Hills’ in Arabic) before a well-earned lunch break. To round things off, you’ll make like the Three Wise Men and set a course for the little town of Bethlehem. Not bad, eh? At 427 m below sea level, the Dead Sea is the lowest point on earth. Today you’ll get to tick off another #lifegoal as you float around in it. Next up: we’ll pay a visit to the Sea of Galilee (where Jesus is said to have walked on water) and the St George Monastery (which clings to the side of a cliff in the Judean Desert). Finally, we’ll swing by the Ein Gedi oasis for a selfie or two before we reach Nazareth. 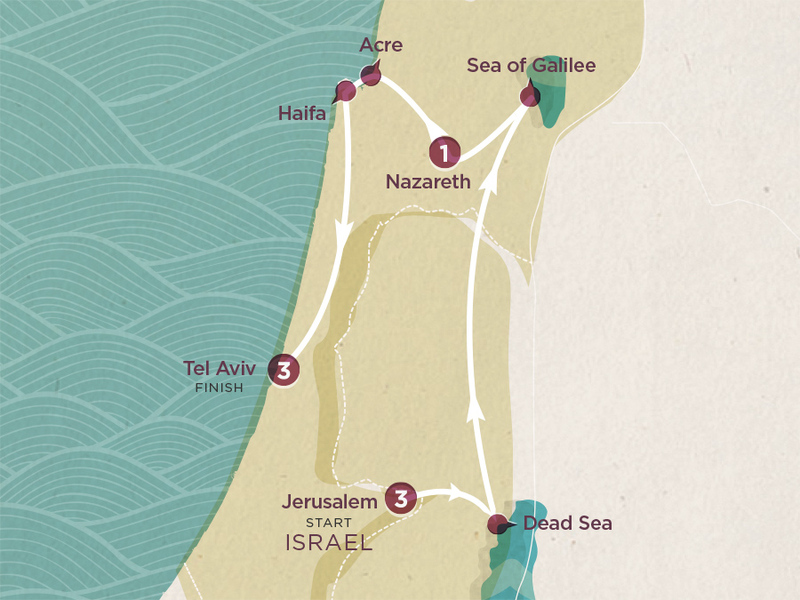 Today you’ll get your daily fact fix and then some on included tours of Nazareth, Acre and Haifa. As we make our way around, we’ll tick off some historic Templar and Crusader ruins and the super fancy Bahá’í Gardens. When your camera roll is nice and full, we’ll hit the road to Tel Aviv. This morning, it’s up and at ‘em as we take to two wheels on a guided bike ride through Tel Aviv. Later, we’ll take a walking tour through one of the city’s most ancient areas: Old Jaffa. Feeling hungry? You won’t want to miss today’s included tasting tour at Levinsky Market! What’s it gonna be? Whether you want to pull up a sun lounger and work on that tan, hunt down some local delicacies and have a picnic or simply wander around on a Snapchat spree, anything goes on today’s beach visit. When the sun goes down, we’ll toast the end of the trip with one final group dinner (cue allll of the emotional hugs). Then: what better way to celebrate your last night with your trip mates than with an optional nightlife tour? Today marks the final chapter of your journey – after breakfast, it’s time to head home.